p.s. Stay tuned for press info/coverage of all our projects, as well as free downloads…check back from time to time…uploads will be available soon, in time for October, which is National Anti-Bullying month! 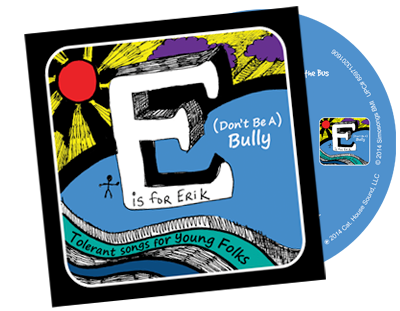 E Is For Erik is a 12-song musical journey, introducing a multitude of subjects, including: language arts, math, science, tolerance, civil rights, culture, social skills, and just plain Fun!!! E Is For Erik is a compilation of children’s songs, written/performed by Erik Simonsen. There are also a couple of “gems” included in this collection that have been “road tested” & well received by all young people – songs dealing with acceptance and tolerance, important topics that should be introduced to our youth at an early age. Erik has performed for various schools & special needs groups throughout the state of NJ – these songs are “kid-tested” and mother-approved!” With the help of Bill Caterini and others, E is for Erik was recorded and developed as a fun way for young folks to enjoy learning. 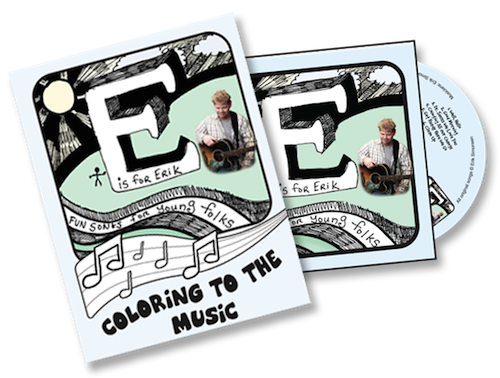 E Is For Erik is both entertaining and interactive (CD and coloring book) for the young ones. Erik has performed these songs for various schools and special needs groups throughout the state of New Jersey. The coloring book was a nice addition to the song collection – Patty Morgan (fine art/illustrations) and Michele Faulkner (graphic artist) put this book together, as an interactive tool for the song collection; each page of illustrations corresponds to a song on the album (CD). Be sure to enjoy the song samples, located on the about page. You can click here to visit (and “like”) our Facebook page. Post a “hello,” send us an email … we’d love to hear from you! Thanks, and enjoy the music!